Ladakh is characterized by heritage inspirations, slow dance movements depicting ancient legends, sparkling show of majestic head dress, beautiful attires and melodious musical compositions. Ladakhi music played in monastic festivals is quite similar to Tibetan music which involves religious chanting in Tibetan or Sanskrit as an integral part of the religion. Religious mask dances are also a notable part of Ladakh’s Culture. An annual masked dance festival is organized in Hemis monastery. These dances reflect the story of the fight between good and evil. In the end, the good become successful in getting victory. The origins of the mask dances dates back to the 8th century. This shrouded Dance is also better known as Cham Dance. The Cham dance is a part of Buddhist festivals. It is a sacred, lively, masked and costumed dance. It is practiced and performed by the monks of almost all the monasteries. The mask that monks wear represents various deities and demons, as well as animals. Sometimes they dance holding ritual instruments. Other monks accompany them, playing traditional Tibetan instruments. There is a leader present who keeps time with cymbals, while others play wind instruments or drums. The different folk forms of music are Jabro Dance, Tukhstanmo dance, Spao dance, Loshon Dance, Shoudol dance, Mentoq Stanmo dance, Shon dance, & Koshan dance of Leh. 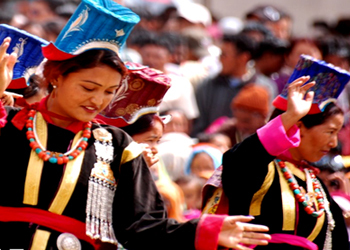 Jabro Dance: – In the hills of Ladakh are groups of women who perform the Jabro dance to welcome the New Year. Jabro is a gentle form of dance with small, elegant movements. Tukhstanmo dance & Spao dance: -The Tukhstanmo dance has originated from Zanskar and Bakhamul area whereas the Spao dance is a dance associated with legends of warriors. Loshon Dance & Shoudol dance: -The Loshon dance is a dance performed during harvest festival at Shey village. The Shoudol dance is the solitary dance that involves backward steps of dancing performances. Mentoq Stanmo dance: -The dance is popularly known as flower dance with recitation of songs. Shon Dance: – This is a royal dance and a legacy of royalty. The dance is performed in the honor of King by performers.